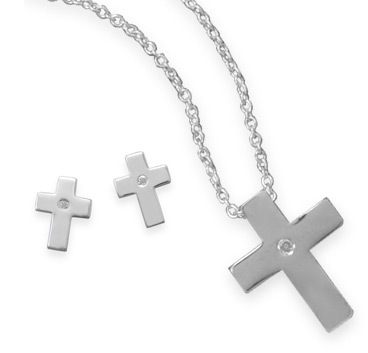 From our "Let Your Faith Shine" diamond cross collection, this set brings together our diamond solitaire cross necklace and earrings in one affordable price. This is for genuine .925 sterling and authentic diamonds. Diamond weigh a total of 0.045 carats (0.03 carats for the earrings and a single solitaire 0.015 carat on the cross necklace). 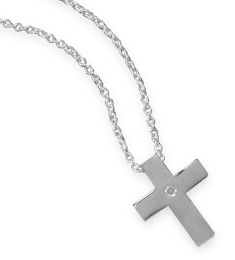 Necklace is 18" in length and the cross pendant ,easures 16.5mm x 13mm in size (0.65 inches x 0.51 inches). Matching stud earrings measure 12mm x 9mm in size (just under 1/2" x 0.35 inches). Earrings You can also purchase each jewelry piece separately (shown below). Includes free shipping & our 45-day return policy. "The LORD make his face shine upon thee, and be gracious unto thee:" (Numbers 6:25). Apples of Gold Jewelry is a Christian-owned fine-jewelry company who's mission is the glorify the Lord Jesus Christ in our work. We guarantee our Diamond Solitaire Christian Cross Necklace and Stud Earrings Set to be high quality, authentic jewelry, as described above.